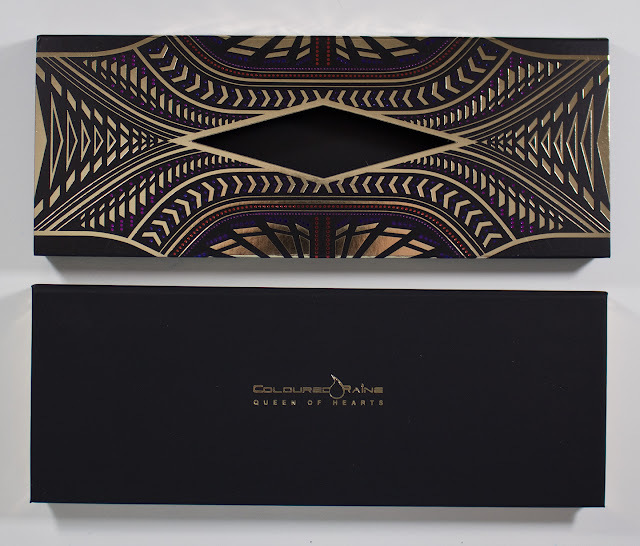 Coloured Raine Queen of Hearts and Cheers To The Beauty Palettes. The Coloured Raine Queen of Hearts Palette retails for $50US for 1.5g / 0.05 Oz each pan or Total Net Weight 17.5 g/0.62 Oz. eyeshadows product in each palette. 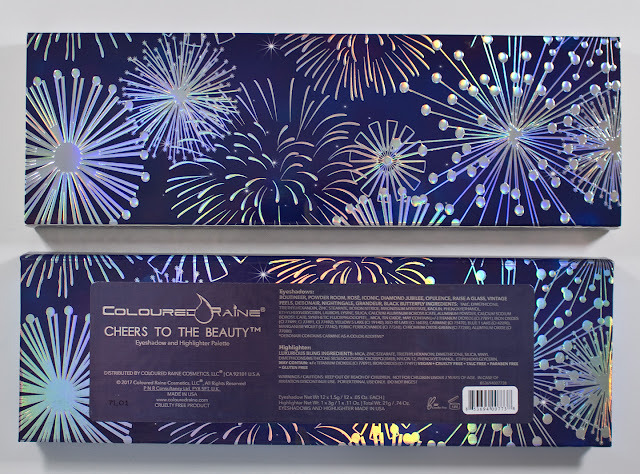 The Coloured Raine Cheers To The Beauty retails for $50US for 12 x 1.5g / 0.05 Oz per pan eyeshadows and Highlighter Net wt 1 x 3g / 0.11 Oz of product in each palette. 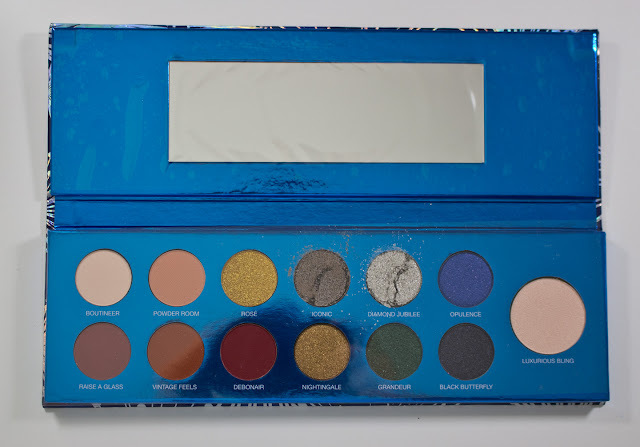 This palette if official on clearance now at 50% off. 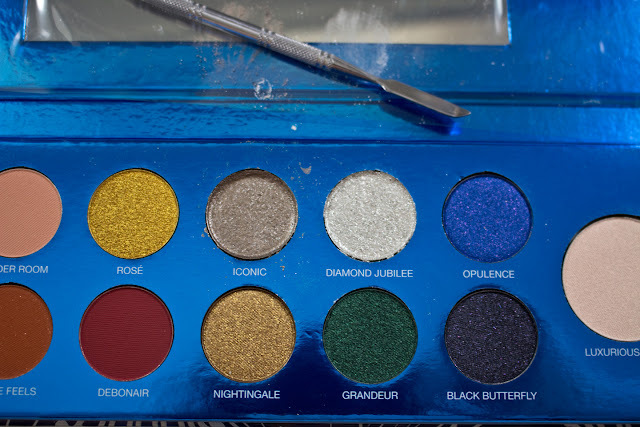 Coloured Raine Queen of Hearts: Crown, Royal Highness, Your Majesty, Princess, Empress, Queen Mother, Heir, Royal Prerogative, Noblewoman, Ladyship, Duchess, & Dethrone. Coloured Raine Queen of Hearts, jacket and palette front. 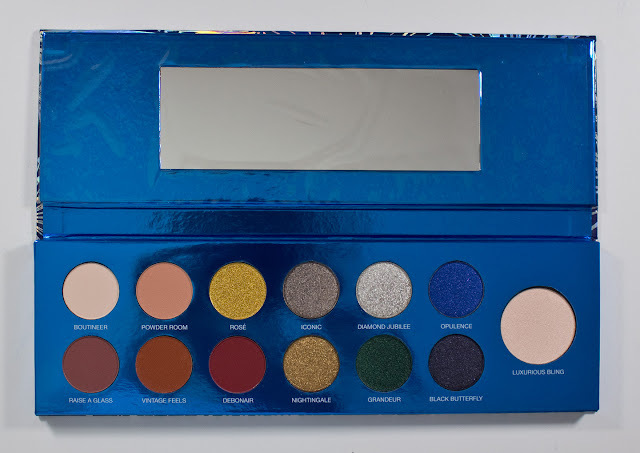 Coloured Raine Queen of Hearts, jacket and palette backside with ingredients. 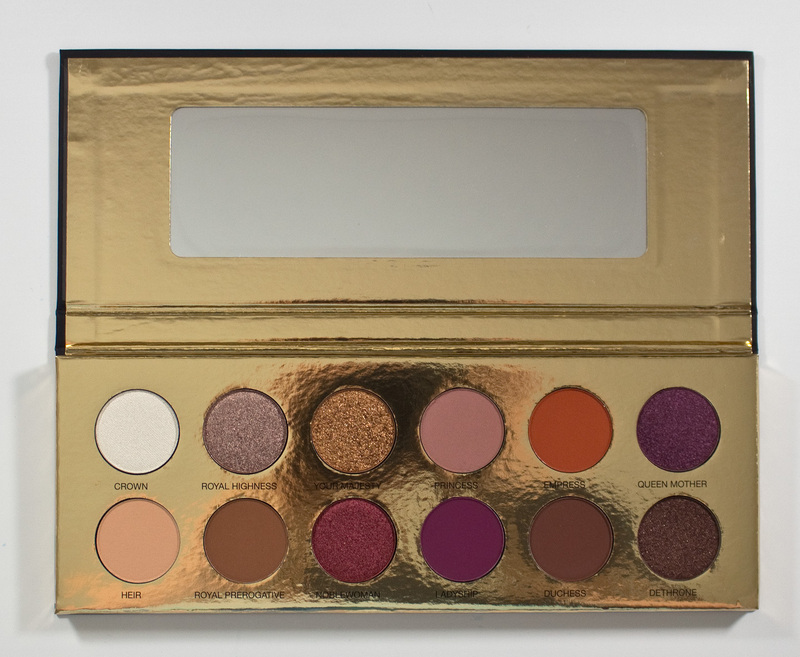 Coloured Raine Queen of Hearts, jacket over palette front. 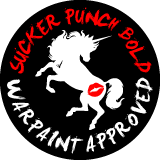 Raise A Glass, Vintage Feels, Debonair, Nightingale, Grandeur, Black Butterfly. Luxurious Bling Highlighter. Coloured Raine Cheers To The Beauty, jacket and palette front. 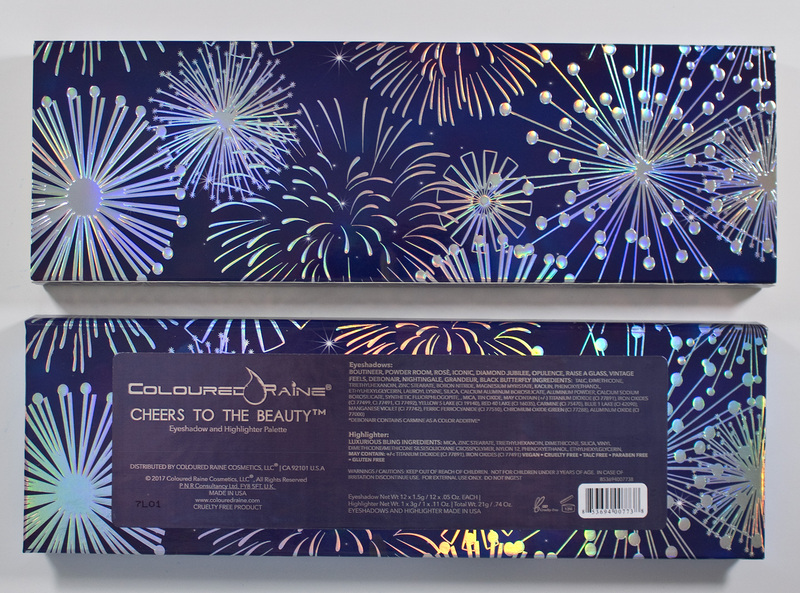 Coloured Raine Cheers To The Beauty, jacket and palette backside with ingredients. The Matte shades in these palettes are on the powdery side with excellent pigmentation and blendability. Breakaway is the only Satin finish with a pearl glow and its buttery smooth slightly sheer from what I can tell just due to the fact that it's almost my skin tone. The Metallic/shimmer shades do pack a punch regarding pigmentation, and the texture is buttery which allows you to sheer out nicely as needed but also intense enough to last on the skin. Crown is a white slight pink shift and a shimmer/pearl finish. Royal Highness is a light rose taupe with a shimmer finish. 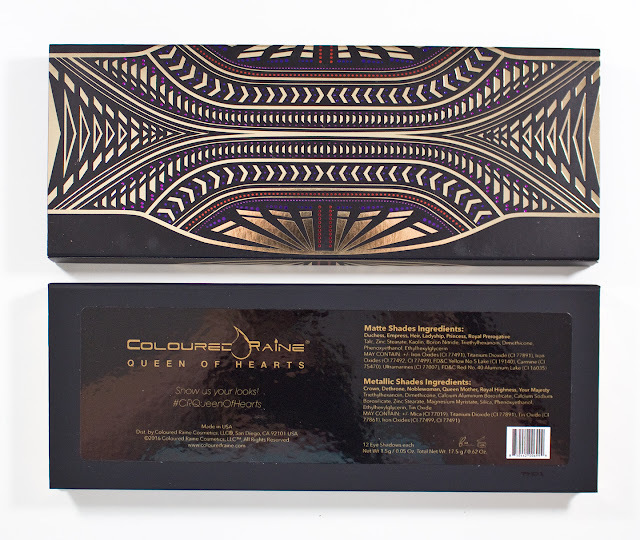 Your Majesty is a warm light bronze with a shimmer finish. Princess is a dusty rose beige with a matte finish. Empress is a burnt bright orange with a matte finish. Queen Mother is a rich plum with a shimmer finish. Heir is a pale orange with a matte finish. Royal Prerogative is a is a camel brown with a matte finish. Noblewoman is a rich rust red with a shimmer finish. Ladyship is a rich berry with a matte finish. Duchess is a warm brown with a matte finish. Dethrone is a deep brown with a shimmer finish. Boutineer is a pale ivory with a matte finish. Powder Room is a cool light peach with a matte finish. Rose is a yellow gold with a shimmer finish. Iconic is a silver taupe with a shimmer finish. Diamond Jubilee is a is a silvery-white with a shimmer finish. 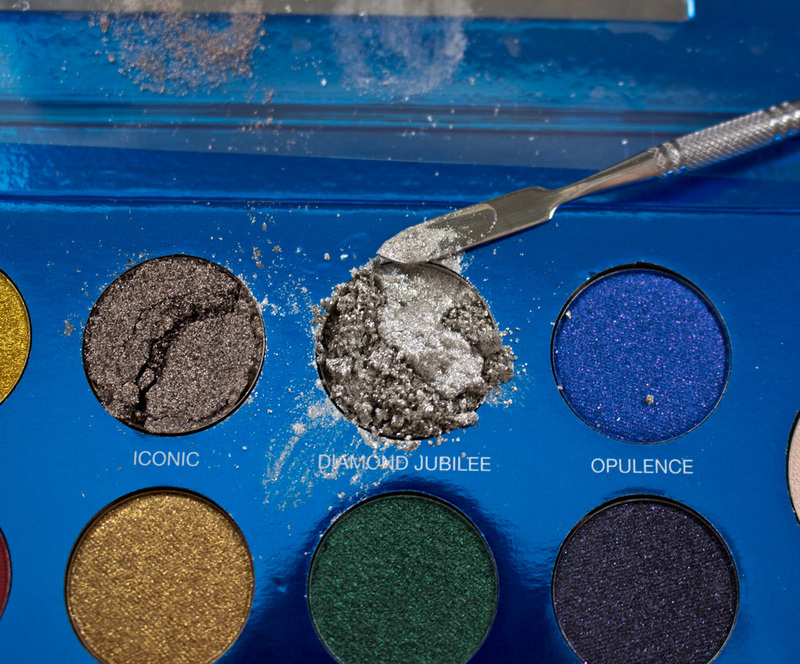 Opulence is a deep rich royal blue with a silver and purple micro shimmer finish. Raise A Glass is a dusty brown mauve with a matte finish. Vintage Feels is a is a burnt umbra matte with a gold shimmer finish. Debonair is a bright rust red with a matte finish. Nightingale is an antique gold with a shimmer finish. Grandeur is a deep forest green with a black base with a shimmer finish. Black Butterfly is a black base with purple/blue shimmer finish. Luxurious Bling is a pale champagne with a peach shift aura finish. Wear: I get close to 8-9 hours of wear without a base. The highlighter wears for 10+ hours on bare skin an longer over other products. Packaging: The palettes are a cardboard box with a full mirror in the lid and with a magnetic closure. The both have a slip jacket to keep the palettes closed but also protects the palettes in shipping. 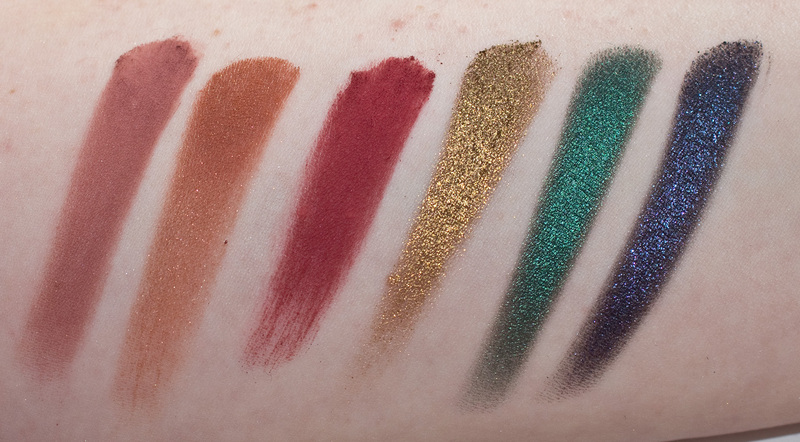 Daylight swatches: Crown, Royal Highness, Your Majesty, Princess, Empress, & Queen Mother. 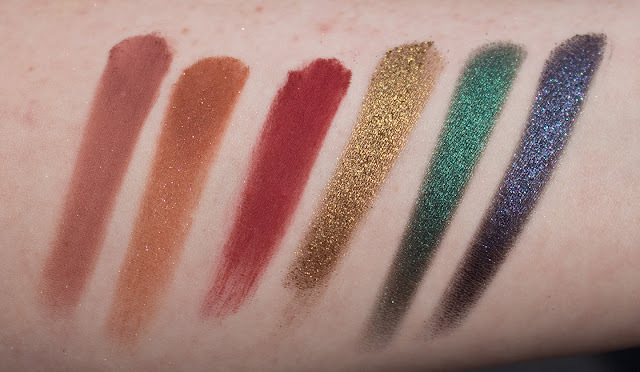 Flash swatches: Crown, Royal Highness, Your Majesty, Princess, Empress, & Queen Mother. 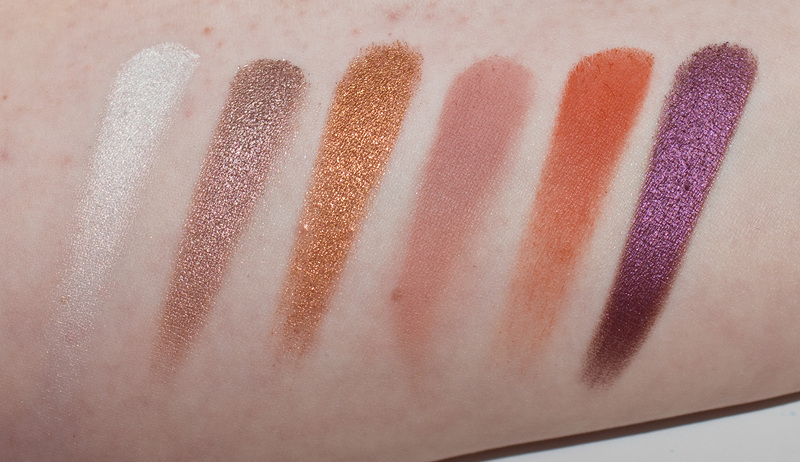 Daylight swatches: Heir, Royal Prerogative, Noblewoman, Ladyship, Duchess, & Dethrone. Flash swatches: Heir, Royal Prerogative, Noblewoman, Ladyship, Duchess, & Dethrone. Daylight swatches: Boutineer, Powder Room, Rose, Iconic, Diamond Jubilee, & Opulence. 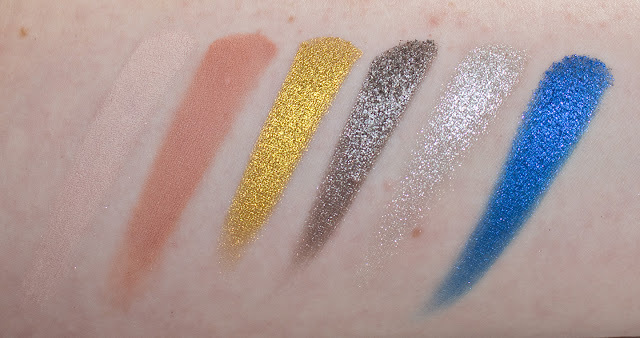 Flash swatches: Boutineer, Powder Room, Rose, Iconic, Diamond Jubilee, & Opulence. 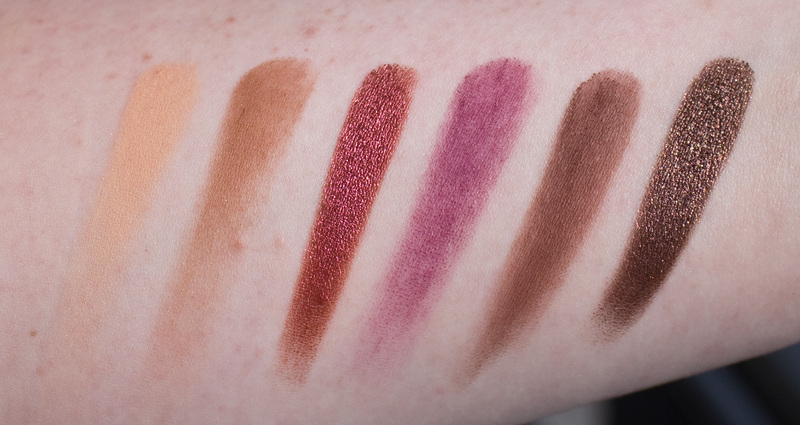 Daylight swatches: Raise A Glass, Vintage Feels, Debonair, Nightingale, Grandeur, & Black Butterfly. 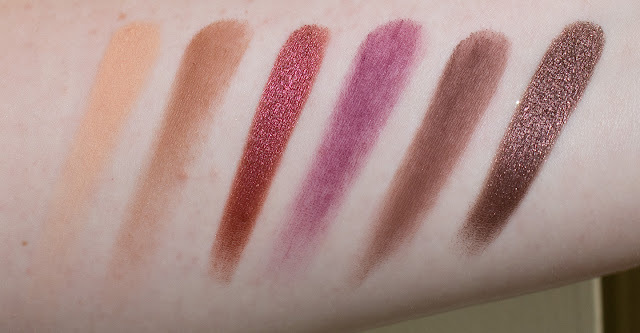 Flash swatches: Raise A Glass, Vintage Feels, Debonair, Nightingale, Grandeur, & Black Butterfly. 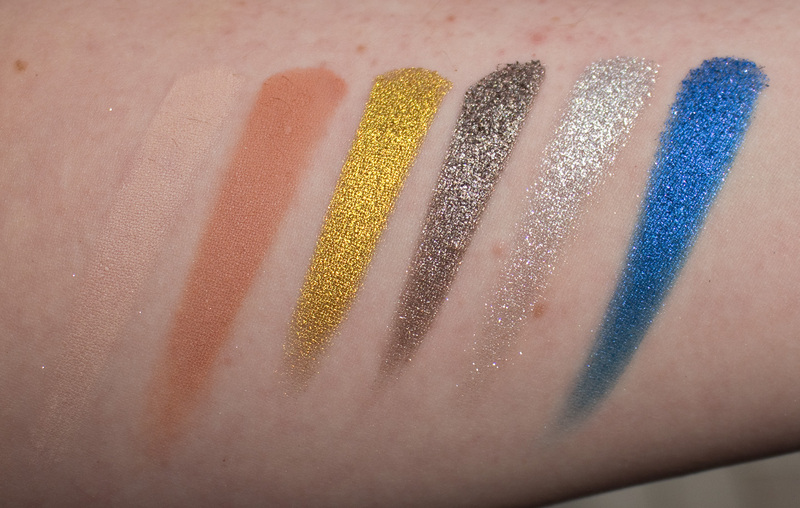 Daylight & Flash swatches: Luxurious Bling, applied heavy and buffed out. 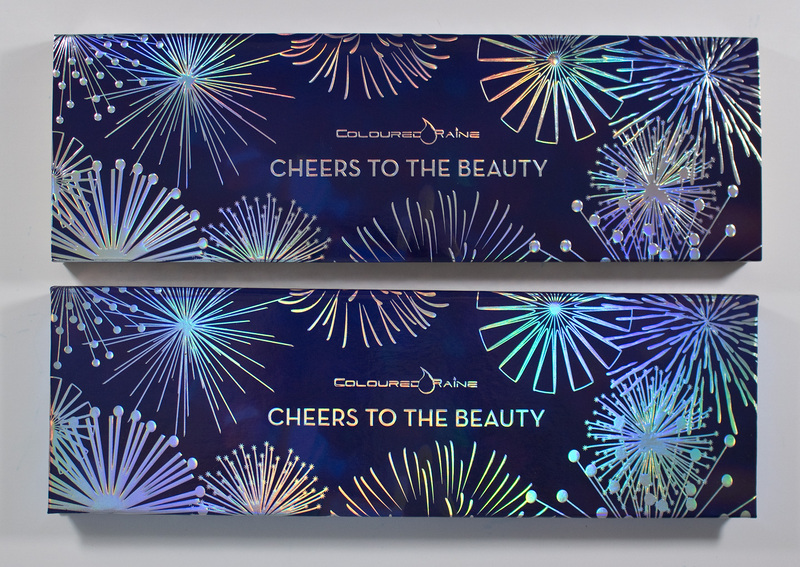 Coloured Raine Cheers To The Beauty Palettes. 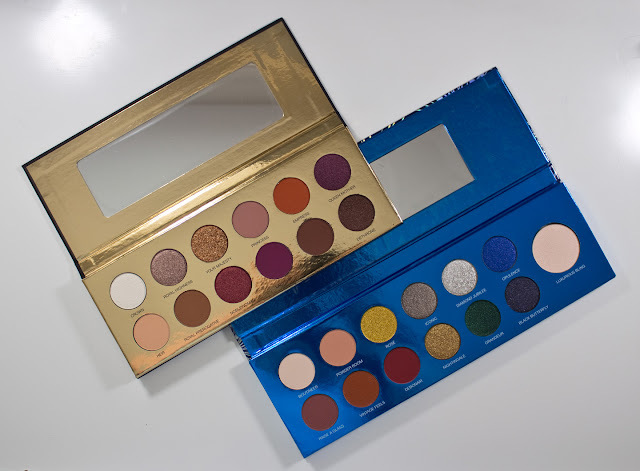 I did get my first Coloured Raine Cheers To The Beauty Palette shattered in the mail as these two foiled eyeshadows in Iconic and Diamond Jubilee. These shadows are easy to fix with basic alcohol I use 99% but 70% work just as well but take longer to dry. 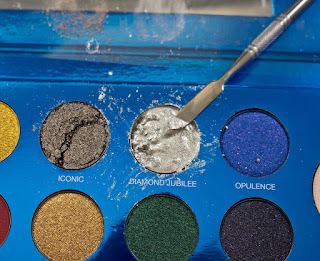 Break up the shatter eyeshadow with a metal/ easy to clean tool with alcohol. I have metal spatulas from off of eBay now. I do this easy to do in the palette/pan. Add a few drops of alcohol and mix into to powder to make a paste. Once it all mixed and use a quarter sanitised with alcohol wrapped in paper towel to repress these two eyeshadows. It takes about 24 hours for the eyeshadows to dry out with 99% alcohol once that done the eyeshadows work just the same as the original one. These palettes have really excellent eyeshadow shades in terms of performance and they make me want to purchase more of their single shadows in the future. They Custom Server was on the ball as well as I place a larger order during a sale and this Cheers To The Beauty palette with one of their lipsticks came shattered but sent a replacement for both items in the mail when I asked what their policy was on broken products, I also sent a photo just to show the issue as well.